Swimming Teaching: How Can I Maintain My Pool In An Eco-Friendly Way? How Can I Maintain My Pool In An Eco-Friendly Way? One of the negatives about pool ownership that many people worry about are all the chemicals they feel are necessary to maintain the pool. Sometimes, “eco-friendly” and “chemical-free” can’t be used about the same pool, and it’s challenging to figure out what to do. With regular use, your backyard pool will accumulate debris on the top and in the baskets. You don’t need any chemicals to skim that stuff out of there with the skimming tools that came with your pool. You just have to take the action regularly, before it turns into a bigger problem. Even if you use a professional company to come in and clean it all out, do some skimming on your own when leaves, sticks and other stuff gets in there. A well-skimmed pool makes for an efficient circulation system and less chlorine is required. 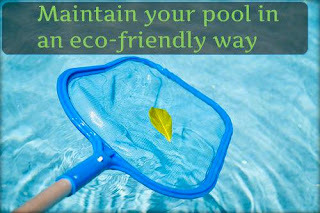 Vacuuming is another way to maintain your pool and keep that eco-friendly moniker. Naturally, vacuuming doesn’t require any chemicals and it takes the skimming concept a step or two further. Your pump and filter are used during the vacuuming process, so remember to keep an eye on them as you go, especially if there is a lot of dirt on the sides and bottom of the pool. If the filter seems clogged, shut the vacuum off, clean it out and then continue.